Direct links exist between postural control and fine motor skills due to neuromotor pathways that activate when heavy work is used. The links include attention and control of movement for the muscles that move the eyes (i.e. reading) and those that move the hands (i.e. writing or keyboarding). 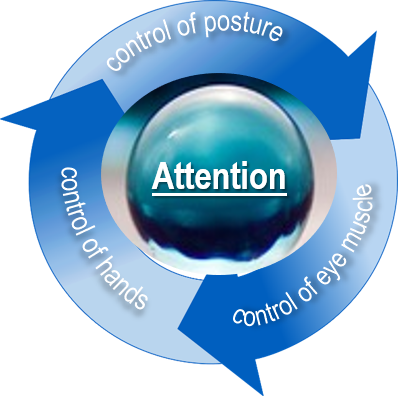 Postural control is an essential ingredient needed for successful eye hand coordination skills. When the back is able to maintain erect sitting for 10 – 15 minutes of classroom work, this shifts the work of the upper mantle of the brain away from control of posture and towards attending to the job of taking in information from the environment. Cues such as listening when the teacher is speaking, processing visual cues from books, tablets, classroom tools, and social behavior can then be attended to. The ability to sustain an erect sitting posture needs to be available on a subconscious level so that the upper portion of the cortex can be free to multitask skills such as decoding sight words, visualizing spelling words, mental manipulation of math facts, and social skills. A regularly scheduled home program of resistive exercises often needs to be revisited and adjusted to keep up with physical growth and social changes as a child transitions to a new classroom.